The landlocked country of Botswana is one of Africa’s most popular destinations for foreign visitors. The political stability and continuing GDP growth in the country has meant that more and more resources are being used to boost tourism in the region. This is not only great news for Botswana’s economy, but for those looking to experience an authentic Botswana safari that is both affordable and sustainable. Despite global recessions over the last ten years, the travel and tourism sector hasn’t seen any dramatic drops in the number of annual visitors to Botswana. This beautiful country has intriguing landscapes, geographical wonders and luxury accommodation. An abundance of wildlife, birds, premium national parks and reserves all work together to make this a prime safari destination. The annual green season takes place between October and March each year and is called such due to the high levels of rainfall the region experiences. These rains are vital in sustaining the delicate ecosystem of the country. The green season is considered the ‘low season’ for travel to Botswana, which means substantial reductions in safari package prices; great news for travellers on a budget. The heavy rainfall means new life in Botswana. Most animals give birth during this time, so expect plenty of baby animals exploring their world for the first time. The landscape of Botswana is transformed from arid savannah to lushly greenery. Daily rains and an increase in vegetation might not be ideal for wildlife sightings, but this makes the thrill of a sighting that much more valuable. 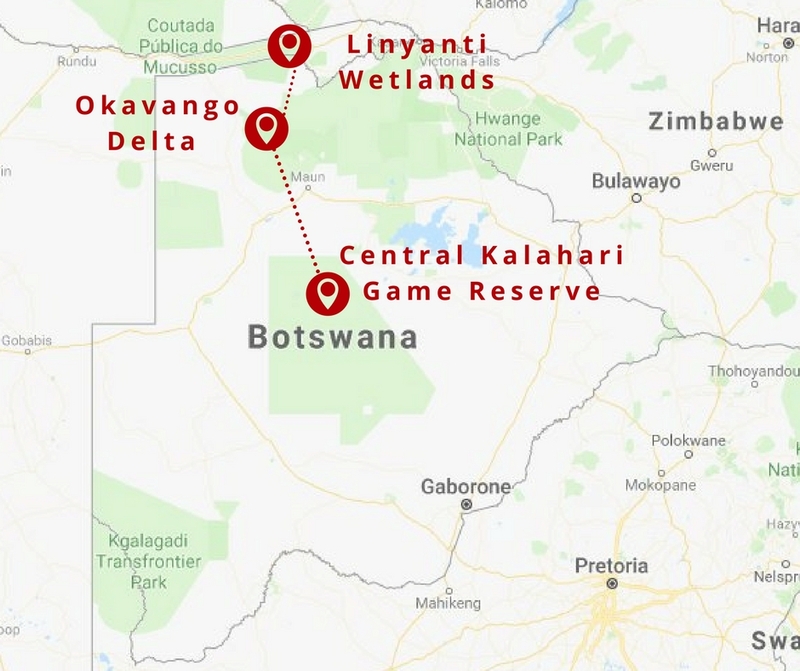 The following itinerary has been developed to optimise game viewing during this period, with a seven-day northern trip that begins at the Central Kalahari Game Reserve, crosses the Okavango Delta and ends at the Kwando Linyanti wetlands alongside the Chobe river. - Game drive and walking safari with professional guides included. The Central Kalahari Game Reserve is a semi-arid region and the second largest reserve in the world. The changing landscape delights with each location boasting unique flora and fauna. As the home of the San bushmen, who have been foraging and hunting in the area for thousands of years, the historical and geographical significance of the area cannot be stressed enough. In addition to the Big Five, this reserve includes giraffe, Cape wild dog, jackal and aardvark to name just a few. 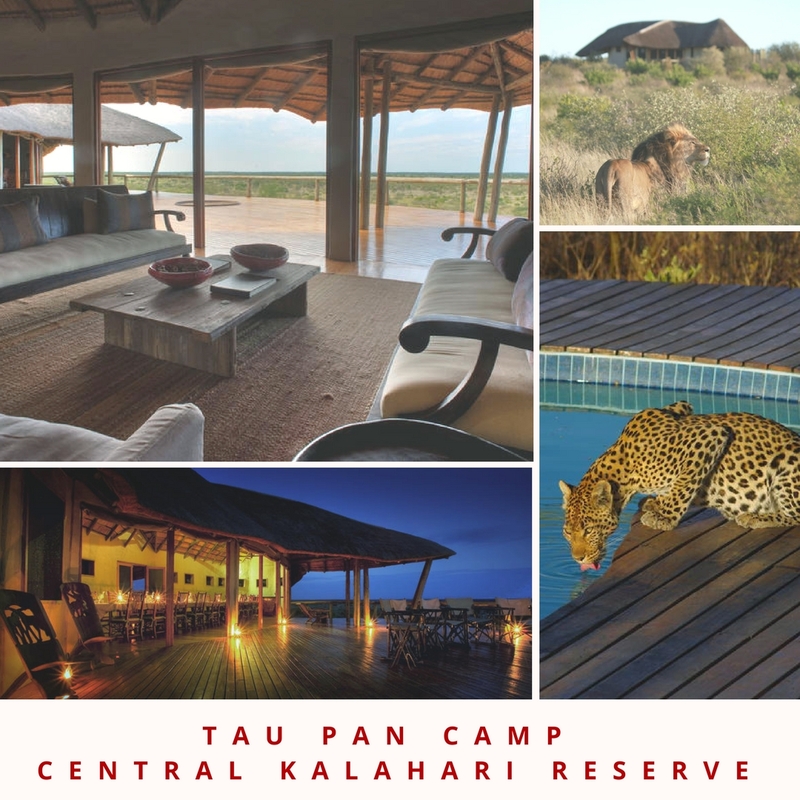 You’ll be exploring this incredible area from the Tau Pan Camp, a rustic and isolated semi-mobile camp with luxury facilities and rooms. Spend your two days between exhilarating game drives and cultural walking tours with San guides who know the Central Kalahari Game Reserve by heart. Learn about their fascinating culture and spend your evenings under the clear and starry African sky. The Okavango Delta is often christened the gem of Botswana. This 7000 square mile fan-shaped area is characterized by papyrus and palm-fringed waterways, thick woodlands,, ox-bow lakes, lagoons, flooded grassland and fascinating wildlife. This land of contrasts deep within the African interior is a product of millions of tonnes of sand deposited there by the majestic Okavango River that traces its origin from Angola highlands. 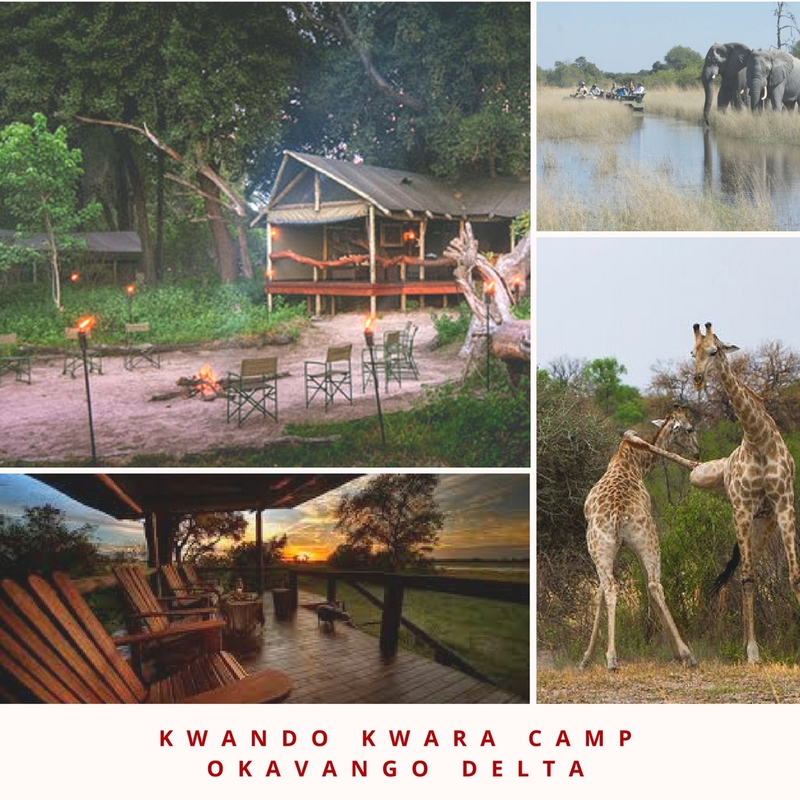 Located next to a tranquil lagoon on the Okavango river is Kwando Kwara Camp. The prime positioning of this wooden wonder means panoramic views that stretch over the river. Expect to see plenty of elephants and hippos as you relax on the wooden deck. The stilted rooms are ideal ‘glamping’ spots and visitors rave over the delicious food on offer at the camp. Try a mokoro ride for the first time and experience why this area is a bird watching hotspot, particularly during the green season. The Linyanti wetlands are a pristine area of land that stretches from the Okavango Delta to the Linyanti River in the Chobe National Park. The waterways, marshes and grasslands of the surrounds bring large numbers of trumpeting elephants and harrumphing hippos and all manner of wading birds. The Linyanti wetlands are renowned for birds and has been declared an international Important Bird Area (IBA). Look out for rare species like the Dickinson's kestrel, eagles and raptors, the Verreaux's eagle-owl and African scops-owl. This important habitat is also home to the critically endangered African wild dog, cheetah and spotted hyena. 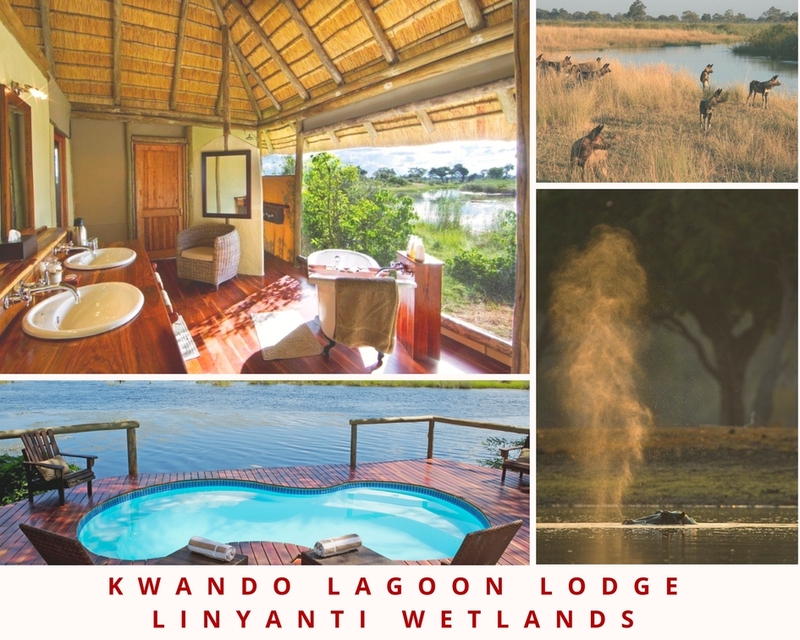 The Kwando Lagoon Lodge lies at on the banks of the vibrant Kwando river, a hotspot that draws wildlife from the surrounding bush. Cape buffalo are a common sight, as well as lion and other apex predators. The lodge itself is the picture of luxury with stunning wrap-around views of the area. Comfortable and cosy, this thatch and canvas lodge offers suites all with exquisite views over the lagoon. It’s not unusual for the occasional inquisitive elephant to come visit. The best way to wind down after a day on a game drive is with a sunset boat cruise along the river, sipping your sundowner of choice. There is something so natural and authentic about Kwando Lagoon Camp. When season permits, try your hand at fly fishing in the river. You never know what surprises the lagoon will offer. If you have any enquiries regarding a safari during the green season in Botswana, please pop us an email with your contact details at info@discoverafricagroup.com and we will gladly call you back.